Is dosa your bae? Get hooked on to not just one or two or even 50 kinds because Mr. Pando’s in Besant Nagar has a whopping 160 varieties of dosa on their menu, starting at INR 40! Imagine you step into a place and ask “What’s on the menu”? And in typical style reminiscent to small-scale eateries the waiter says “Kerala-Style, Pizza, Chocolate, Italian, Palak Paneer, Paneer Cheese, Chinese Chilli, Mushroom, Pav Bhaji……” Phew! Of just dosa? That’s exactly what we discovered at Bessy beach this week! 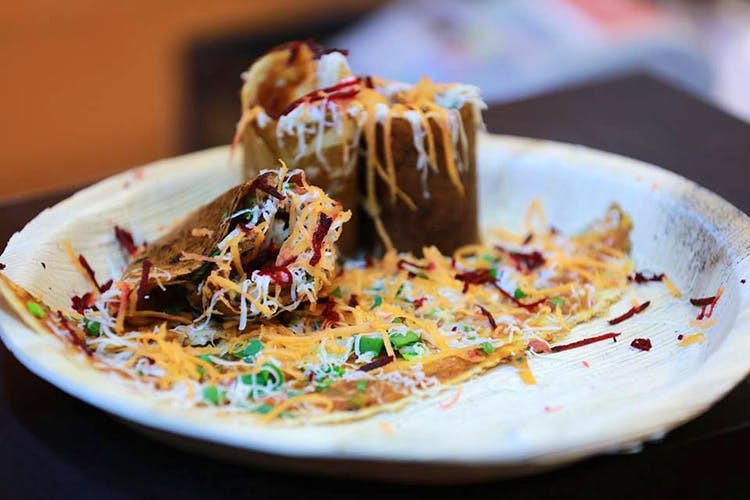 Reminding us of the many quirky dosa stalls under towering Bombay buildings and Khao Galis, Mr. Pando’s is a small eatery at the corner of Besant Nagar, right next to Murugan Idly. Small in size maybe, but man this place has a menu too huge to select from; we’ll tell you some of their signature dishes worth trying. This week we ditched the plain dosa and set out to experiment with our classic dish. What we tried was the Pizza Dosa, Topped with melted, gooey cheese and Italian seasoning, this was delicious. Another dosa that was worth picking up from this menu was their Pav Bhaji Dosa/ Schezwan Pav Bhaji Dosa. This one is packed with flavour and easily serves two people. (unless you have a voracious appetite, of course). You could also go ahead and try their Paneer Cheese, American Chopsuey Chilli Cheese and Spring Roll Chilli Cheese to name a few others. And that’s not all. If you’re in the midst of a sweet tooth craving and land up here, then you can order their chocolate and dry fruit based dosas too! So, which one will you be trying?